The code above will happily execute. However, notice that Finished! was logged out first despite our use of await before urls.forEach. The first problem is that you can’t await the entire loop when using forEach. 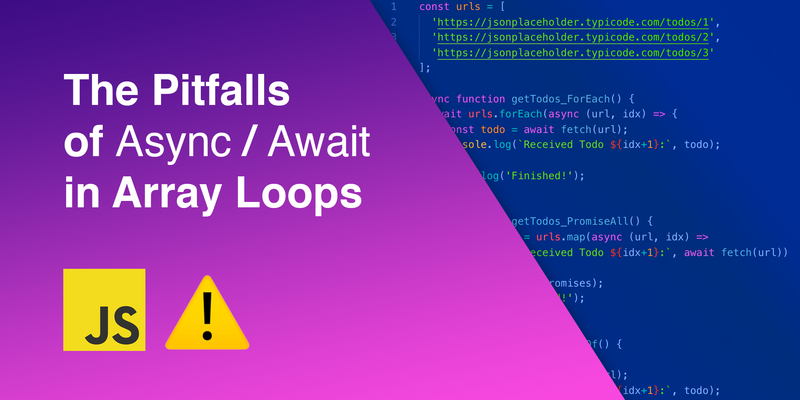 In addition, despite the use of await within the loop, it didn’t wait for each request to finish before executing the next one. So, the requests were logged out of order. If the first request takes longer than the following requests, it could still finish last. For both of those reasons, forEach should not be relied upon if you’re using async/await. We’ve solved the issue of waiting on every request to finish before continuing onward. It also appears that we resolved the issue of the requests happening out of order, but that’s not exactly the case. As mentioned earlier, Promise.all executes all of the promises given to it in parallel. It won’t wait for the first request to come back before executing the second, or third request. For most purposes this is fine, and it’s a very performant solution. But, if you truly need each request to happen in order, Promise.all won’t solve for that. We now know that forEach doesn’t respect async/await at all, and Promise.all only works if the order of execution doesn’t matter. Let’s look at a solution that solves for both cases. I particularly like how this method allows the code to remain linear — which is one of the key benefits of using async/await. I find it much easier to read than the alternatives. Note: You can also use basic for loops to get all of the benefits of for...of, but I like the simplicity and readability that for...of brings to the table. 👏 If you found this article helpful and would like to see more, please let me know by leaving some claps! 🔗 Follow for more articles like this. Software engineer with a passion for learning and sharing knowledge.